According to the American Hair Loss Association, by age 35, more than two-thirds of men will experience some degree of hair loss. Depending on how much hair is lost, and how soon it happens in one’s life, this can be quite distressing. In fact, it’s not only men who suffer from hair loss and hair thinning, an almost 30 million women experience this. Las Vegas plastic surgeon, Dr. Christopher Khorsandi, offers a minimally invasive solution that looks and feels natural. The technology uses Follicular Unit Extraction (FUE), a method that utilizes the state-of-the-art NeoGraft Automated Hair Transplant System. "Wow, just wow. After so many years going back and forth about getting my hair restoration done I finally did it in 2018. From day one, I felt so comfortable with the staff. Lee Millard was the person who walked me though every step of my journey. Not only was he knowledgeable he was also someone I can talk to about all my fears and concerns. The day finally arrived for my restoration, I was greeted by the staff that will be doing my transplant. Needless to say I was nervous and on edge. The lovely ladies made me feel so relaxed and at home and did everything they could to make me comfortable. Willy was the on who drew my hair one and nailed it the first try. He understood my expectations and what I was looking for. All through the procedure they talked to me and told me what was going on. I was so comfortable I fell asleep a few times and had to apologize about snoring hehe.Please ... if your looking for a hair restoration, please contact VIP first. My only regret was I waited so long." "Love everything about this place! The employees, the owner, the results! My wife has had lip fillers and has been beyond happy, we've both gotten Botox here and for the first time ever it's actually worked on me and stayed for a while! I've had FUE hair transplants and I'm currently 4 months post op and hair is coming in nicely! Can't wait for my 6 month mark to when I can see more or less full results!" "Dr. Khorsandi is one of the finest physicians I have ever known. I am so honored to be under the care of such a brilliant surgeon. I am a 53 year old man with high expectations. And I guess celebrities know a good thing, because you run into them every time you visit his office. Here's the thing. Dr. Khorsandi and his staff treat everyone like they are celebrities. I have been his patient for some time now, and the doctor and his entire staff are friendly, welcoming, and highly skilled. The waiting area is impeccable, and you get to watch informative cutting edge videos of Dr. Khorsandi at work behind the scenes. Really captivating stuff. From the beginning, Dr. Khorsandi spent quality time listening to me and then making deeply thought out suggestions for my facial improvements. Lower eyelids, laser skin resurfacing, injectables, and through his other excellent practice, hair transplants. He instructed me to be patient with the healing process, advised me on post care expectations for a man my age, decided the best hair transplant technique, and we planned the surgeries. Now, two and a half months after the surgery, he and his staff have nurtured and cared for me every step of the way. No surprises. Just as he said, new hair growth has begun. Just as he explained, I am seeing my lower eyelids healing slowly, but each week they look better and better. Additionally, he has been speeding the healing process along with facial and laser treatments. My skin is dramatically improved, the deep wrinkles on my forehead are GONE. Dr. Khorsandi moves at a timely pace, but he is a perfectionist and does not rush patient care. I love his subtle approach to natural results. I feel so fortunate to be one of his lucky patients. Thank you VIP Plastic Surgery for dramatically improving the quality of my life." Follicular Unit Extraction (FUE) using the NeoGraft technology, is a less invasive approach for hair transplant surgery. The FUE method removes individual hair follicles from the scalp in groupings of about 1-4 hairs, and is then placed in the areas of the scalp where balding or hair thinning has occurred. The technology uses pneumatic controls (air compression) to achieve this. 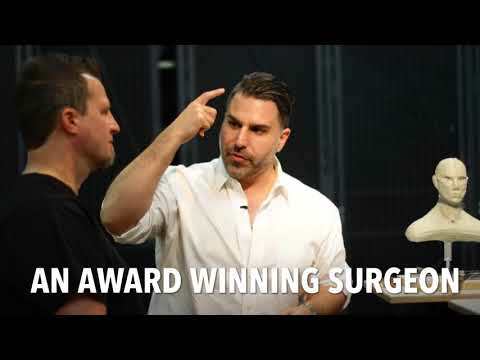 The benefit to this approach, is that a patient does not have to suffer with a linear scar on the back of the head as some of other traditional approaches create (sometimes referred to as the “strip method” of hair replacement). NeoGraft offers a natural look with limited downtime. NeoGraft is recommended for patients who do not want an aggressive, invasive approach that will lead to scarring. It is suitable for both men and women. Patients who enjoy wearing their hair short and want to keep an active lifestyle (i.e. exercise and sports) would benefit from this approach. The NeoGraft FUE System is also used to help achieve improvements to the scalp for patients who had previous body hair transplant procedures that left a linear scar. NeoGraft’s technology can be used to help camouflage prior scarring. NeoGraft is performed in-office under local anesthesia. The automated tool “punches” out small grafts of healthy hair follicles and implants them into the area where more hair is desired. The entire procedure can take up to 2-3 hours to complete depending on how much hair is transplanted. During the procedure, there is no scalpel incision, no sutures or staples used, which means there will be no linear scar on the back of the head. The average patient can return to work within a day or two. Exercise and strenuous activity should be avoided for about 1-2 weeks just to ensure the implanted area is safely healed. Results vary by patient, but most patients will see new hair growth within 4-6 months. The cost of NeoGraft will depend on the amount of grafts needed to fulfill the patient’s aesthetic desires. Sometimes, multiple sessions may be needed. Generally, pricing for NeoGraft is charged by the graft, and can range from $4.50-$7.50 per graft. For some patients, 500 grafts is enough to make a noticeable difference. For others, 1,000, 1,500 or 2,000 may be needed to attain the desired results. Men and women who are self-conscious about their thinning or balding hair can achieve desirable results with hair restoration through FUE using NeoGraft. Patients who undergo this procedure are pleased with the outcome. On average, patients can attain 50-60% of new hair growth within the first year following surgery.